The Creative QT Stuff 'n Sit is the perfect solution for all those stuffed animals your kids won't let you get rid of but never play with. The best in bean bag stuffed animal storage, this pouf chair meets your needs for tidiness and comfortable seating all-in-one. With five stylish patterns to choose from, our bean bag for kids provides your kid's playroom, bedroom, or living room with an extra splash of color, accenting your existing decor. 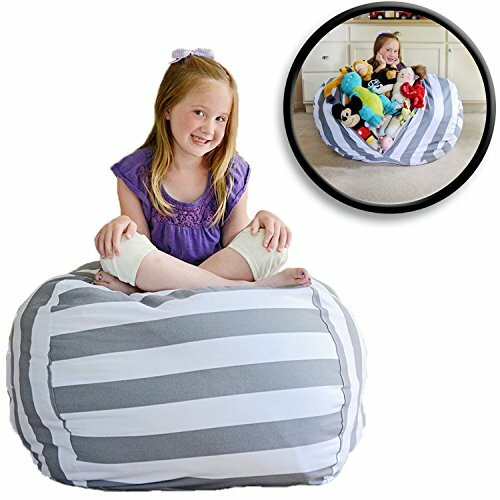 We all could use some additional storage to help us instantly clean up, and this floor pouf ottoman tucks away your kids stuffed toys in a jiff! Creative QT was founded by husband and wife team Adam and Dana Sue Hinkle. Parents of 5 we strive to create tools to help busy parents succeed in their #1 job.... forming our crazy munchkins into awesome people. Our three product goals are fostering imagination-based play, promoting organization, and facilitating parent/child engagement; cultivating in families more creative quality time. We're right beside you in the journey of developing kids and we want to help you to continue to be the hero in your kid's adventures, both real and imaginary. THE ORIGINAL STUFF 'N SIT - Our stylish stuffed animal storage organizers help you take control of your entire stuffed animal collection, wrapping approximately to 90 toys in one comfy pouf ottoman to instantly clean up the room. If you have any questions about this product by Creative QT, contact us by completing and submitting the form below. If you are looking for a specif part number, please include it with your message.